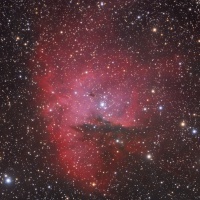 NGC 281 – also known as the Pacman Nebula – is the most famous star forming area located in Cassiopeia. Embedded in dust and faintly illuminated hydrogen clouds, the bright parts of the cloud consist of ionized hydrogen, gleaming as stimulated by the ultra-hot blueish stars forming the core region of the Pac Man Nebula. 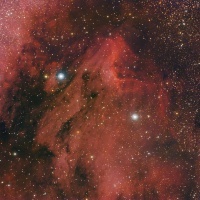 To the left, some blue reflection nebulae can be spotted as well. Extremely deep images reveal that the Pac Man is only the core part of a hydrogen cloud easily extending beyond the boundaries of this picture. 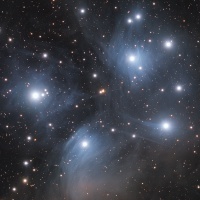 The Pleiades or „seven sisters“ are certainly the most popular star cluster in the norther hemisphere. Easily spotted by naked eye even under light polluted skies, deep photographs reveal remnants of the interstellar matter from which the young hot stars formed no more than some 125 million years ago. 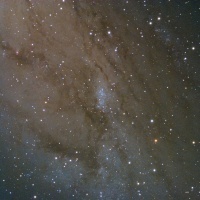 NGC 206 is a giant open star cluster located in our neighbour galaxie M 31, also known as the Great Andromeda Nebula. 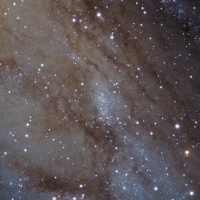 M 31, and hence NGC 206, are approximately 2.3 million lightyears from Earth. It is amazing that today’s amateur technology allows us to resolve single stars within the spiral arms of M 31, while no more that some 100 years ago the biggest telescopes available were necessary to identify those brightest stars. The image also contains plenty of tiny detail like a number of globular clusters of M 31 and several background galaxies. Make sure to see the annotated image. 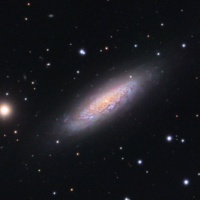 NGC 6503 in the constellation of Draco is a small spiral galaxy classified as Dwarf. Being in a distance of about 18 million lightyears from Earth, is at the edge of an empty patch of space called the Local Void. The main disk reveals plenty of detail. There are lots of HII-regions indicating zones of star creation. Also, a number of associations of blue young, hot stars can be spotted. The picture is the revision of an older image taken 11 years ago with a Vixen VMC 260L. As time has passed, more detail could be revealed hence this image replaces the earlier. Make sure to also view the full resolution crop linked beneath the main picture. 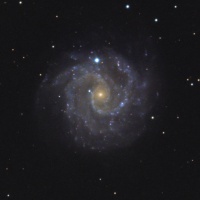 Not much needs to be said about M 108, a great spiral galaxy in Ursa Major, apparently situated right next to the famous Owl Nebula (M 97), a Planetary of our own Milky Way. Both contrast nicely given that they are separated by some millions of lightyears. 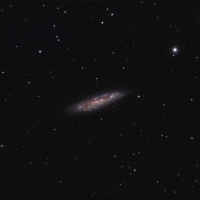 M 108 itself reveals several dustlanes indicating that we are looking at this galaxy from the edge (although it is not a perfect edge-on like NGC 891 for instance). This is the official first light image for the new Celestron 11 Edge HD telescope taken under very good seeing conditions. Make sure to look at the full resolution image. NGC 3184 is an often overlooked target in the spring skies despite its almost perfect face-on shape. Situated at the „leg“ of Ursa Maior, it can be well observed from the winter months until late spring. Being about 50,000 lightyears in diameter, NGC 3184 is about half as extended as our Milky Way. Indication of the distance from Earth varies between 25 to 40 million lightyears. The objects in the catalogue of van den Bergh (vdB) are mostly weak reflection nebula. This is the very first of its brothers, by no means stronger then them. 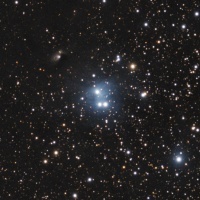 A pale blue glow surrounding a group a bright stars which cast their light on interstellar matter. A close companion, but very different in nature, is the faint galactic nebula GN 00.08.88 to the north-east of vdB 1 . 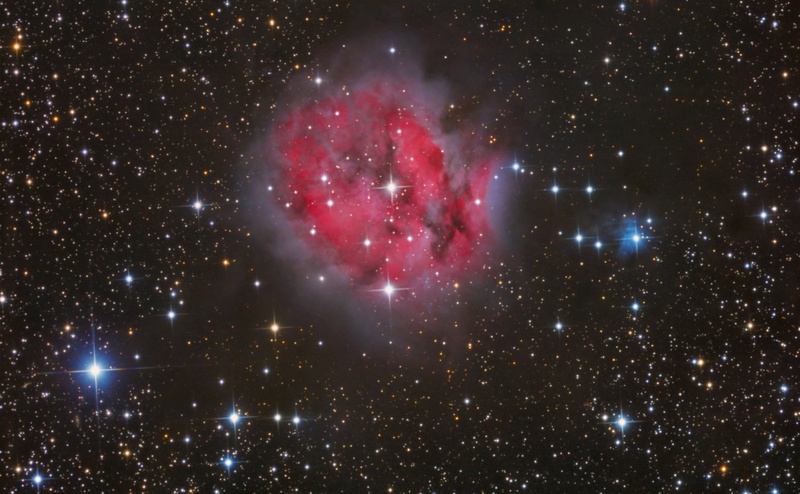 Not much is known about this tiny nebula but it nicely contrasts with the reflection nebula. The Pelican Nebula is part of the allegedly most famous nebula complex of the skies: the North America Nebula. Situated right next to it, the image shows the Pelican and the western part of North America. This picture is the first light of my new Celestron 11 EdgeHD Hyperstar. Imaging at F2, the total integration time was 1 hour only. NGC 206 ist a giant star cluster located not in our Milkyway but rather in M 31, the Andromeda Nebula. The Andromeda Nebula itself is said to be similar in size and kind to the Milkyway, our own galaxy, but is some 2.2 million lightyears away from Earth. The light collected for this image has thus been emitted long time before human life evolved. 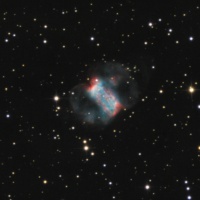 The Little Dumbbell Nebula (M 76) is certainly one of the best known objects in the autumn skies. The central bar is bright enough to be easily seen through mid-sized telescopes even under lightened skies. The central star is a close (optical) double-star with a distance of only about 1.4 arcsecs, although in fact the fainter component is really behind the nebula, so this pair is not a physical double-star.